WPP CEO and founder Sir Martin Sorrell and the United Nations comms leader tell PRWeek how and why the world's six biggest marcoms holding groups got together to launch a scheme in support of the UN's Sustainable Development Goals. 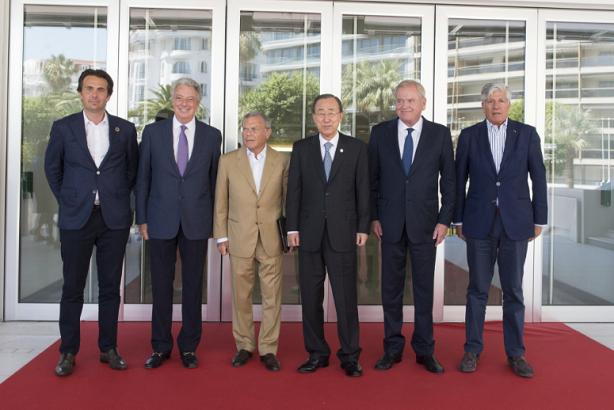 The Common Ground initiative was launched by UN secretary-general Ban Ki-moon in Cannes at noon on Friday. His under-secretary-general for comms and public information Christina Gallach was also present in Cannes, and spoke to PRWeek global editorial director Steve Barrett about the initiative. Common Ground will see the six networks - Dentsu, Havas, IPG, Omnicom, Publicis Groupe and WPP - launch global campaigns on the goals, with each firm having specific areas to promote individually. Speaking to PRWeek in Cannes (from 2:26 in the video below), Sorrell explains that the programme had its roots in a challenge issued to him and his counterparts in Cannes this time last year by politician and activist Al Gore. While that focused on climate change, Sorrell said: "We thought we could broaden it, because climate change plays a role I think in 13 of the 17 development goals." "Usually we compete violently... but on one issue we're totally aligned, and that is on supporting the secretary-general's sustainable development goals," he said of the collaboration. In the first half of the video, filmed on Thursday as the UK public was voting on its membership of the EU, Sorrell predicted that the UK would remain, and explained why he felt this was important. In the event, the UK voted to leave the EU. The UN's Gallach told PRWeek that ad firms and PR agencies had an important role in "shaping the world's public opinions". Referencing the fact that Common Ground will work to involve other businesses in the campaign to achieve the UN's goals, she said: "I think the message to business is that we have huge challenges and don't expect that governments, public organisations and institutions will be able to address and to bring solutions - we need a partnership with all those that can have an impact."